Travel the way we do and grab a copy of the summer issue of print magazine Luxury Travel – out now with the latest news and luxe destination stories for luxury travellers. Australia's only specialist luxury travel magazine produced exclusively for the consumer leisure luxury travel market, Luxury Travel magazine this week releases its 61st issue and the first edition of 2015. It includes the third edition of the Annual Travel Planner, a guide to some of the world's most luxurious accommodation and travel experiences. Leading with a cover story of the new and luxe exotic, we reveal the world's most exciting emerging exotic destinations that luxury travellers can still be among the first to visit – looking at the five types of exotic travel and why they appeal to luxury travellers. We invite our readers to travel the way we do by introducing an exciting new initiative, the Luxury Travel magazine ITINERARIES. We simplify the process for those inspired to book their next holiday from the pages of Luxury Travel, by working with destination specialist agencies to help our readers to book the exact holiday they read about. Our first Luxury Travel magazine itinerary is a bespoke adventure throughout India in search of tigers. Our new expanded Travel&. section now includes news of luxury epicurean destinations and experiences around the globe; this issue includes articles on the world's top 10 resort restaurants and a review of wines with altitude and what's being poured for business and first class passengers on five airlines. Specialist travel writers visit one of the world's hottest culinary destinations in Lima, Peru; along with a look at the fine traditions and modern expressions of Japanese cuisine and the best places to dine throughout the country. We also have writers share their immersion stories and cultural experiences from such destinations as the Gobi Desert in Mongolia; a luxury travelling camp in Kashmir; the ports of Lisbon; the street markets in Thailand; the new-look cowboy culture of Dallas; and an all-girls' surfing adventure in Bali. We visit, stay and review luxury global properties in New York, Bali, Hawaii and Dubai. The summer edition also features our regular sections with a look at a luxury ski destination (St Moritz); rail journey (through the United Kingdom); luxury cruise (through the Mediterranean); golf course (a luxury Sydney day on the green); family luxe options (Fiji and Noosa); walking adventures (the Great Ocean Road); and a luxury health and wellness retreat (in New Zealand). We continue to report on the latest luxury hotel openings, travel accessories, tour operators and airline news throughout the world. Readers of this summer issue of Luxury Travel magazine are also treated to a special 52-page supplement called The Girls' Guide to Dubai – outlining the best places to dine, shop, stay and play in the luxury United Arab Emirates city. 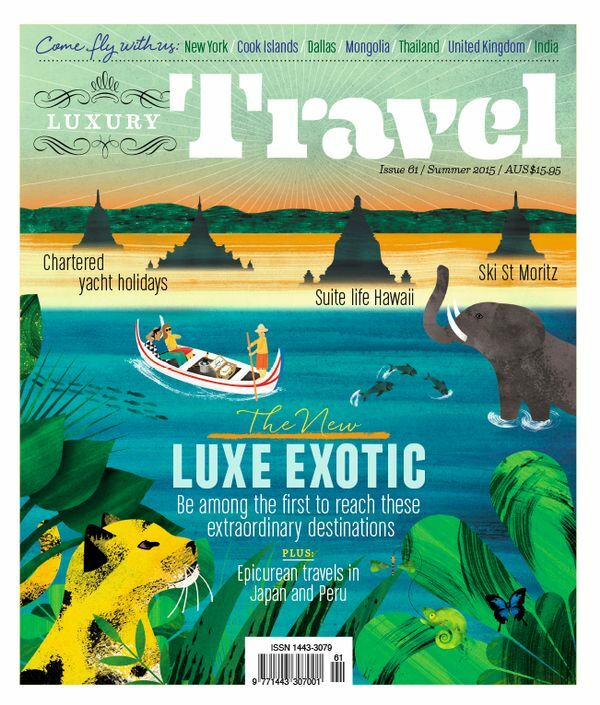 Luxury Travel magazine is a quarterly print publication now in its 15th year. It is produced in Sydney by Magnesium Media, led by editor-in-chief Susan Borham, new editor Katrina Holden and the publishing team headed by Adam Davy.